The Great hornbill is the largest bird in the family of hornbills. As the name suggests, great hornbills can be recognized by a bright yellow helmet (called "horn") that sits atop the large bill; this decoration is offset by the black and white plumage. Ornithologists suggest that the purpose of the helmet is to attract females. Great hornbills extend up to 47 inches in length, with a wingspan of 60 inches. They grow to be fifty years old (in captivity). There are 45 known species of hornbill. 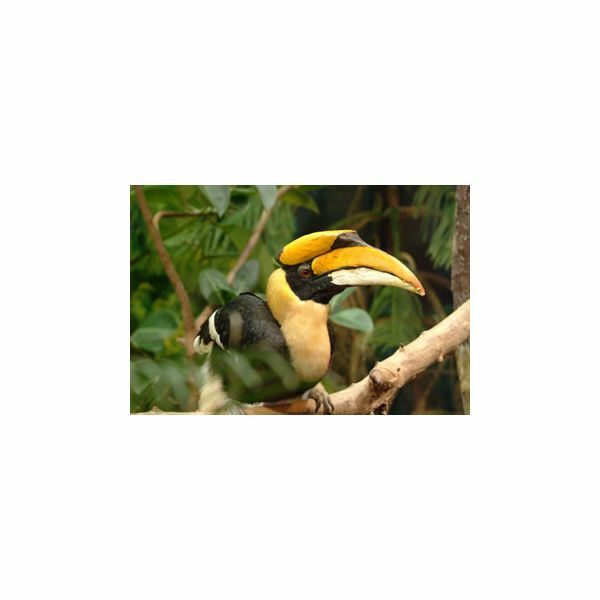 Great hornbills live in various parts of India, Malaysia and Indonesia, mostly concentrating in fruit-rich woods. Their diet consists of various fruit and an occasional animal: small reptiles, mammals and even birds. Other species of hornbill live in African countries and have adapted to living in savannas. Great hornbills live in groups of up to 40 birds, and form monogamous relationships. The entire flock may participate in the process of courting. The way in which this species of birds grows their young is probably their second most striking feature. The male and the female have a distinct set of responsibilities when caring for their young: the father seals the mother inside the nest (usually consisting of a hollow tree trunk), where she broods and warms the eggs, while he brings food to the rest of the family. When the chicks hatch, the mother leaves the nest, and both parents continues to feed the chicks until they are able to fly and take care of themselves. The International Union for Conservation of Nature and Natural Resources lists the bird as “near threatened.” Partly due to their unusual breeding habits, great hornbills are very difficult to grow in captivity, and only few cases of successful reproduction are known. Loss of habitat is the primary cause for population decrease. Feathers, bills and other body parts from great hornbills have significant cultural value in some local traditions, which leads to hunting and decrease in numbers.